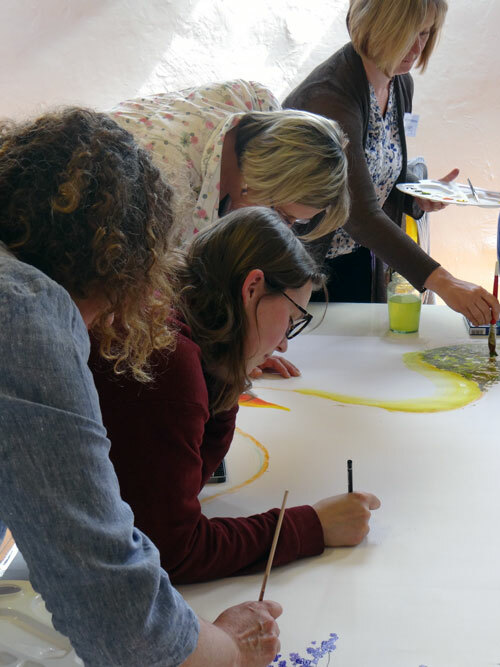 In spring this year I was lucky enough to attend the APP art workshop at Coombe farm near Dittisham in Devon. Having suffered from PP after the birth of my son 4 1/2 years ago and having spent my career in the visual arts the event seemed tailor-made for me, on paper at least, but I must admit to having been apprehensive in case the experience awakened upsetting memories. In the event, I needn't have worried. Never having met anyone who had experienced PP before, I suddenly found myself one of 13 women at different stages in their recoveries, ranging from some whose episodes had taken place as little as 12 months previously, to others who had experienced the illness more than thirty years before. The shared experience meant that immediate bonds were formed between the women and the choice of location was inspired. This beautiful, fecund corner of Devon was guaranteed to foster a sense of well-being and to help us--the survivors of this horrible illness-- to relax, open up, access memories that were indeed troubling and more usually suppressed, but in an atmosphere of support, understanding, acceptance and laughter. The first group activity we undertook was called 'My Island'. It was collaborative piece in which the participants added images and motifs using a wide mix of media to a very large, roughly drawn out, generic island. The images were intended to be reminiscent of happy times with our families and each participant was moved around the large table at approximately five or ten minute intervals to work on a different area--either adding a new imaginative element (boats, fish and chip shops, piers) or modifying someone else's work. This exercise is apparently more usually used for icebreaking or team-building but it was noted that, even before this first official session as a group, we had already bonded to such a degree as to make that part of the original intention somewhat superfluous! Rather than restricting ourselves to drawing and painting our way politely around a narrow coastal strip, which is apparently how these things normally go, I have distinct memories of participants climbing onto the table so as to add inland forests, mountain ranges and ski-jumps! Although neither Julia nor Anneliese was acting as an art therapist at this event, I think it is true to say that being asked questions as challenging as "What does PP look like?" required each of us to approach our memories of this traumatic illness from very unaccustomed directions and encouraged us to express feelings through direct visual means rather than via the more well-worn therapeutic routes of verbal explanation. The activity of making images, even just manipulating media whilst mentally engaged with this difficult material, provides an unspoken means of processing, perhaps going some small way towards resolving, what were traumatic experiences and extreme emotions. There comes a point when words are simply not enough. As a group we had access to a variety of media, but many found the easily manipulable chalk pastels pleasant to experiment with and the sessions with printmaker Anneliese Appleby introduced the deeply immersive technique of linocut to the group. I suspect that many of the women will continue to pursue these deeply therapeutic activities and make some time for themselves at home. After the very difficult session that dealt directly with our experiences of PP, 'What does PP look like? ', we turned to exercises that expressed our relationships with our children in the present. As a part of this, we were privileged to have a look through a selection of Julia Vaughan's work, which has been concerned with notions of harbouring for some time. Beyond images of the literal 'harbour', the protective arms of the harbour walls suggest a more nurturing containment, such as the woman's body during pregnancy and the protection she continues to offer her children. Many of the women brought photographs and precious objects from home for this session, using collage techniques and framing images in relation to one another. Julia's session about harbouring, and the safe harbour, resonated with me a great deal that weekend. Coombe Farm itself, with its abundance of fresh produce, caught in a sheltering cleft between two verdant hills, felt very safe and very nurturing. It promoted frank, cathartic discussion (which is not nearly as po-faced as it sounds) and, having met such strong, vibrant, funny women at different stages of recovery, moving on with their lives, I for one returned home with a spring in my step and a new cautious optimism.